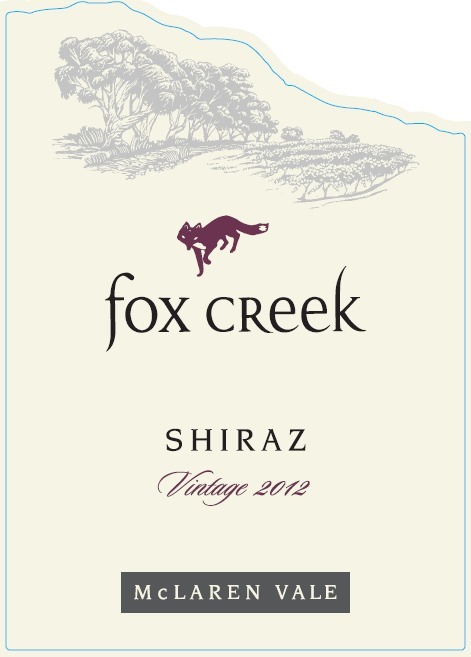 Fox Creek Shiraz 2012 is 100 percent Shiraz. The wine holds aromas of chocolate, cinnamon, and hints of clove. On the palate, the juice is weighted with flavors of plums and black cherry. It is elegant and creamy with well integrated tannin. The lengthy finish holds notes of chocolate and toasty oak. Another great Shiraz from the 2012 vintage. Drink this one now or over the next 4 or 5 years. Moderate temperatures during ripening in Feb and March preserved the bright color and gave us a powerful dark berry fruit flavor profile. Timing of the harvest period was normal, with most fruit enjoying the moderate ripening conditions and became flavor ripe at balanced sugar and acid levels. Each batch was open fermented for 7-8 days on skins with low intensity pump-overs conducted to preserve the primary fruit flavors in the wine. The wine was then pressed off to finish fermentation in tank or old oak barrels. Most batches spend part of their maturation time in old French and American oak. Steak and other juicy red meats. Pasta dishes with rich tomato sauce base. "Bright purple. Exotic, expansive aromas of black and blue fruit preserves, vanilla and cola, along with a peppery overtone and a hint of violet pastille. Broad, fleshy, appealingly sweet boysenberry and cherry liqueur flavors show excellent depth and a seamless texture. Finishes juicy and long, with building spiciness, an echo of blue fruit and round tannins. - Josh Raynolds"
Fox Creek Wines is a family owned and operated winery located in the McLaren Vale wine region of South Australia's Fleurieu Peninsula. The Watts family purchased 32Ha of land in 1984 and then in 1994 established the Fox Creek brand. Throughout the company's 18 year history, Fox Creek has developed a portfolio of wines which is diverse both in premium varieties used and also wine styles. They have also invested heavily in the development of the brand through the completion of a first class, on-site winery in 2000, which has further ensured that the paramount level of quality control, on which the brand prides itself, is maintained from the vineyard to the glass. With a Langton's 'Excellent' Classification, consecutive (Red) 5 Star Halliday ratings, three time 'Bushing Trophy' winner for Best Wine at the McLaren Vale Wine Show and a swag of trophies and gold medals from both Australian and International wine shows; Fox Creek has quickly established itself as one of McLaren Vale and indeed the World's, finest and most iconic wine producers. Senior winemaker Scott Zrna, believes that winemaking is about producing the absolute best. This mentality is evident through all aspects of his craft; from overseeing the operations in the vineyard and caring for the fruit in the winery to ensuring the very best quality product ends up in the glass and on tables around the World. Scott's passion runs deep; he was born with wine in his blood with his family having a long association in viticulture. He spent five vintages with Mildura Blass, a further six with McWilliams Wines and one vintage with Padthaway Estate, before joining the Fox Creek team in 2004. Doctor Jim Watts; specialist and professor of surgery and his wife, -registered nurse- Helen began the Fox Creek story in 1984. They purchased a 32 hectare farming property in McLaren Vale and went about planting vines on the black clay soils which were previously used for grazing sheep and growing barley. The vines thrived, bearing exceptionally high quality and sought after fruit. In 1994 the transition from growers to winemakers began, as the fruit that was previously sold to other wineries, was retained by the family and lovingly crafted into supreme quality wine. As the name 'Fox Creek Wines' suggests, there are many foxes which reside in the creek which runs through the middle of the property. In 1996, the Cellar Door was opened in a nineteenth century stone cottage built in the 1880's by the Malpas' family and in early 2000, construction of the on site winery was completed. Fox Creek actively supports some of Australia's most renowned music and arts festivals, exhibitions and organizations as we believe it is a wonderful way to showcase the wine to a community who are able to appreciate a work of art! Fox Creek believes these mutually beneficial partnerships have promoted the growth and development of the brand through aiding and engaging the wider community whilst also maintaining positive corporate responsibility. Each Fox Creek wine back label also comprises braille, in support of those who are visibly impaired. The on-site 1,500 tonne state of the art winery with modern equipment allows every winemaking operation to be performed to the highest standard. An array of stainless steel open fermenters support high quality, small batch oriented production, in line with the company's "boutique" winemaking approach. Ranging from 2.5 tonne hand plunged versions to 15 tonne elevated units, the construction and positioning of these fermenters means there is minimal post ferment mechanical handling of the grape skins. This allows Fox Creek to extract only the rich soft tannins from the skins, accentuating the fruit driven and full bodied McLaren Vale wine style. Completing the vineyard to glass process, is a purpose built barrel hall to maximise the influence of the range of specialist coopered oak selected to match individual vineyard batches. Stocked with over 1000 barrels of French and American oak, the selection is a targeted mix of Hogsheads, Barriques and Puncheons aimed at matching the intricate needs of each vineyard block. Over time we have developed individual oak programs that best suit each wine style and selected specific barrels that emphasize the wines varietal characteristics. Frequent tasting during maturation ensures the focus on wine quality and allows us to track that the desired oak characteristics are being imparted into the wine. respects the environment, practicing sustainable viticulture and planting of indigenous native trees. of grapes and the close proximity to the coast provides maritime evening breezes which cool the vines overnight, providing ideal growing conditions for premium quality fruit, leading to wines that exude elegance, structure and balance. Sustainable vineyard practice and conscientious attention to the native landscape is maintained throughout the region to ensure future generations will continue to reap the rewards of the amazing wine growing region. Further, significant use of reclaimed storm water in the vineyards, minimizes the impact on the environment and the Murray River, particularly during drought years. McLaren Vale grape growers ensure the consistent production of high quality fruit by living and breathing the mantra, "good wine begins in the vineyard". The Fox Creek environmental conscience carries on into the winery, where a series of solar panels located on the roof produces renewable energy, whereby drastically reducing consumption of environmentally damaging coal generated power.